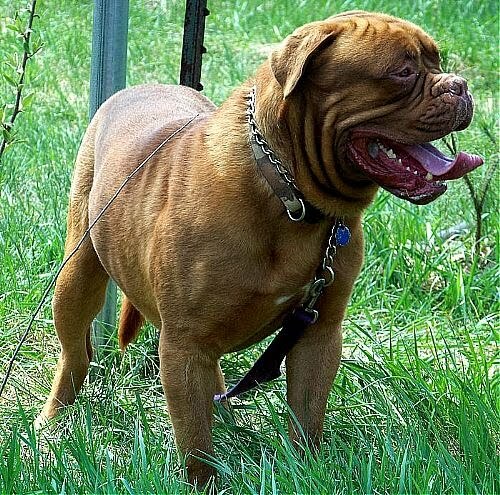 Dogue de Bordeaux is a well balanced, muscular and massive dog with a powerful build. 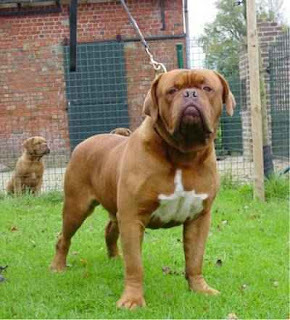 The Dogue's size should come mostly from width and muscles, rather than height. The breed is set somewhat low to the ground and not tall like the English Mastiff. The body of the Dogue de Bordeaux is thick-set, with a short, straight top-line and a gentle rounded croup. The front legs should be straight and heavy-boned. The straight tail begins thickly at the base and then tapers to a point at the end. It should not reach lower than the hocks. The tail is thick at the base and tapers to the tip and is set and carried low. The breed is to be presented in a completely natural condition with intact ears, tail and natural dewclaws. 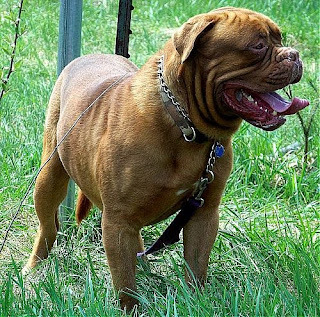 It should be evaluated equally for correctness in conformation, temperament, movement and overall structural soundness.The Dogue de Bordeaux is even-tempered, protective by nature, and is vigilant but without aggressiveness. Dogues de Bordeaux are extremely attached and devoted to their family. They are calm and balanced with high stimulus thresholds. 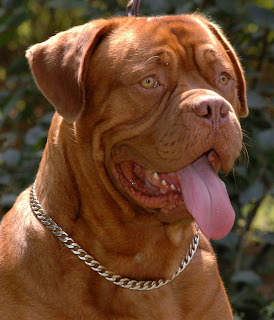 The Dogue is intelligent and can also be stubborn, arrogant, and dominant. Early socialization for this breed is an absolute must. Just cuz your wife won't let you get a dog, doesn't mean derek should. well said chief dude, i couldnt have written it better myself.